Play can mean many things. Games are played. A musical instrument is played. A role or a character in a ‘play’ is played. Common to all these aspects is the idea of becoming absorbed in an experience. We live in an age of play and absorption. X boxes and iPads abound. Tablets are everywhere. We live in an age of technological interaction. We are empowered. The world is, literally, at our finger tips. The future is hard to predict but one thing is certain: interactive flat screen technology has arrived in the classroom. Our children will be players and we wouldn’t have it any other way. Experts have been advocating a central role for play in education for many years. Now, as the IT revolution transforms the classroom, white boards and projectors are being replaced by interactive flat screen technology and it seems that the concept of play has found its place as a key principle in the education of children. Imagination and creativity are no longer repressed but are actively encouraged and rewarded. Fun is no longer frowned upon but welcomed. Games are no longer restricted to the schoolyard but are at the heart of the classroom with award winning educational apps now on the market. It can no longer be denied that young minds understand and remember more in the context of play and nothing facilitates this more than interactive flat screen technology. Most play is interactive therefore it makes sense that introducing interactive technology to the classroom will make the experience of education more playful. Children spend so much time gaming on their tablets and iPads that learning with these devices is associated with play and stimulation. It is also good for the learner’s self-confidence when he/she knows more about using an iPad than the teacher does! 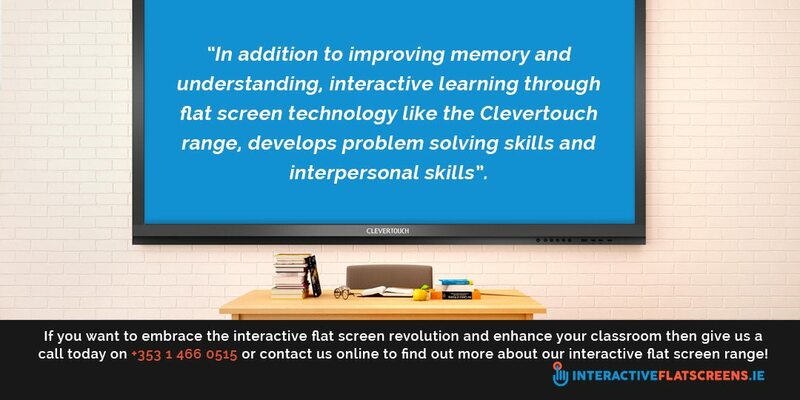 In addition to improving memory and understanding, interactive learning through flat screen technology like the Clevertouch range develops problem solving skills and interpersonal skills. In place of the old rigid one-way system that forced learners to be passive is a two-way dialogic system that empowers the learner and builds up their confidence. Pedagogues might argue that introducing fun and games to the environment causes problems with discipline. Anyone who has children and knows the seriousness with which they take to play will object. In today’s Post Modern society and culture, the notion of play is a defining one and nowhere is it more evident than in the internet and interactive technology. No education can teach you how to live but it can ready you for taking a role in society. This is why education as play, facilitated by interactive flat screen technology, is not only good, it is essential. Educational technology is now all about engagement. 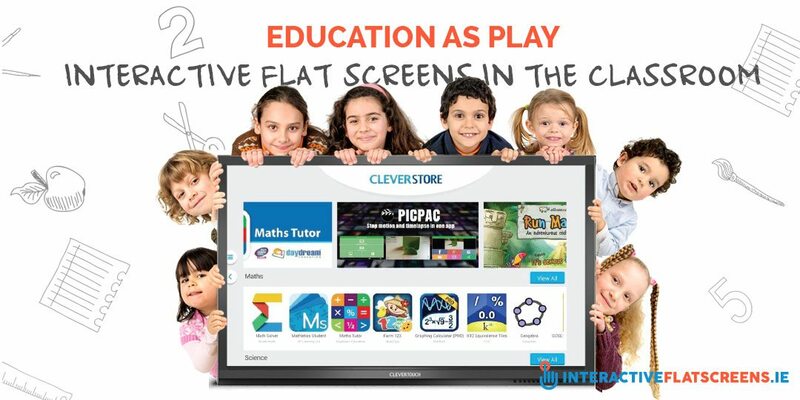 If you want to embrace the interactive flat screen revolution and enhance your classroom then give us a call today on +353 1 466 0515 or contact us online to find out more about our flat screen range!